Mr. Saksena has lived and worked in the London area since 2002. He lives in North London with his wife, who is a Consultant Anaesthetist, and their two children. Mr. Saksena initially trained in Scotland at the University of Dundee. After graduating with honours in 1995, he then went on to complete core surgical training in the UK and Australia. 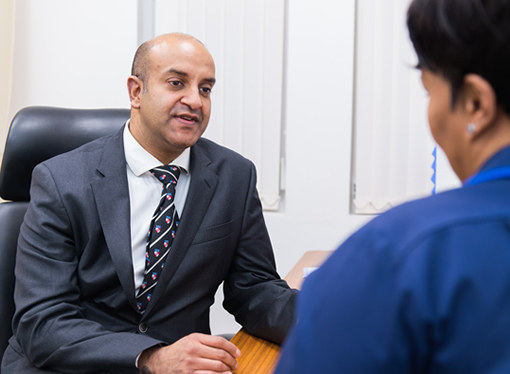 Following this he completed specialist orthopaedic training at the prestigious Royal London Hospital, The Norfolk and Norwich Hospital, and the Royal Free Hospital and Wellington Knee Unit. Since 2009, Mr. Saksena has been a consultant orthopaedic and trauma surgeon, and in the same year also began to expand his work to include medical training. In 2009 he began work as an honorary senior lecturer at the Whittington Hospital, in addition to performing a role as a locum consultant. Currently he is a Consultant Orthopaedic and Trauma Surgeon for the Barnet & Chase Farm Hospitals Trust, and a Director of Medical Education at the Royal Free London NHS Trust. Mr. Saksena currently serves as a faculty member on three orthopaedic courses, and is a member of the British Orthopaedic Association, American Academy of Orthopaedic Surgeons, the British Hip Society, and the AO Alumni. In addition, Mr. Saksena is an author reviewer for several prestigious journals, including the British Medical Journal, the Journal of Case Reports, and The Knee. Mr. Saksena's main clinical interests include hip and knee replacement, arthroscopic surgery, and knee reconstruction and preservation. He is keenly interested in procedures that help preserve the integrity of the hip and knee joints, particularly in younger patients. He regularly performs total knee replacement, total hip replacement, hip arthroscopy, knee arthroscopy, anterior cruciate ligament reconstruction, and joint preservation procedures. Mr. Saksena is also passionate about staying abreast of new innovations in the field of orthopaedics, and regularly attends national and international scientific events. He has been involved in designing and testing several new orthopaedic implants, and has also adopted the use of 3D computer-aided design to improve the service he provides to patients. In his research, Mr. Saksena's main interests lie in improving the outcomes of surgical procedures, and improving quality of life for people who undergo hip and knee surgery. By developing approaches that improve the patient experience from pre-op to post-op, he hopes to improve surgical outcomes and enhance patient recovery for those who undergo hip and knee procedures.